Truly novel issues are, generally speaking, few and far between at U.S. nuclear power plants. Whether it’s a specific type of pipe that springs a leak or an electrical relay that goes on the fritz, chances are good that the problem has been experienced before somewhere across the nation’s fleet of commercial power reactors during the many decades they have been in operation. An issue that has drawn attention at the Salem Unit 2 nuclear power plant, a pressurized-water reactor in southern New Jersey, has to do with the failure of small bolts contained in four reactor coolant pumps. The bolts, measuring 1 inch in diameter and 4 inches in length, are used to secure a turning vane inside the pumps. These pumps stand about 30 feet tall and provide forced flow of coolant, or water, through the reactor to transport heat from the fuel to the steam generators. The steam generators, in turn, make use of that heat by converting it to steam. The steam is then piped to the turbine to spin it and generate electricity. As can be seen in the graphic, water is drawn upward through the suction nozzle at the bottom of the pump via an impeller. The turning vane directly above the impeller then redirects the water toward an opening on the side, from which it flows into the reactor vessel. When a refueling and maintenance outage began at the plant this spring and evaluation and maintenance work got under way, a number of turning vane boltheads were found in piping associated with one of the reactor coolant pumps and in the reactor vessel. (Similar discovery of these boltheads, albeit just a handful of them, had been observed in two prior outages.) Subsequent reviews, which have now included the examination of all of the pumps, have identified dozens of failed or sheared turning vane bolts in all of them. Update: Here is an additional image. Each pump has 20 such bolts. (The arrow shows the approximate location of the bolts.) A majority of the failed boltheads, though separated from the bolt shanks, remained in place thanks to mechanical restraints or tack welds. While this is not a significant safety concern in terms of potentially causing a reactor core damage accident, there are several related operational issues. For one, the boltheads are considered foreign material that could have an adverse impact on reactor coolant system performance if they were to impact key components inside the system. For another, the turning vane could conceivably drop down and come into contact with the impeller and impede or halt its functioning. The cause of the bolts’ failure remains under review, but one possibility is stress-corrosion cracking. Indeed, the NRC issued Information Notices to the industry in the 1990s regarding this phenomenon. A 1994 Information Notice put out by the agency was designed to make the industry aware of stress-corrosion cracking that caused turning vane cap screws to fail at the Millstone Unit 3 nuclear power plant. Also, a 1990 Information Notice discussed the failure of turning vane bolts at a foreign reactor. In a 1995 Information Notice, the NRC made plant owners aware of the loss of integrity for bolt-locking devices in the turning vanes of reactor coolant pumps at the Seabrook nuclear power plant but for a different reason: flow-induced vibrations. PSEG, the owner and operator of the Salem and Hope Creek plants, will have to not only repair the Salem Unit 2 pumps but evaluate what went wrong. For now, the plant remains out of service while this work is taking place. NRC inspectors and specialists will closely follow these activities. One area for consideration will be whether the problem could have been avoided based on previously available information. I would suggest examining the internal parts of the pump in contact with the primary coolant, especially the ones made of low alloy steel lined with (thin) stainless steel. There should be a streak of rust, beginning with a dent/spike (can be as small as 50 microns) and ending with a crack through the lining. It may be indifferently in the inlet nozzle, the outlet or inside the bowl. The streak can be a few mm or several inches or more. The primary coolant penetrates through the crack and permeates beneath the lining from high pressure (150 bars) towards lower pressure regions (atmospheric). Typically, the bolts that are not designed to provide full tightness at these pressures. Depending on the pressure gradient, the vaporization will occur at 85 bars, so anywhere between the crack and the bolts, but most probably at one of the two ends. In this case it happened at the bolts where the primary containment boundary ends (junction lining/steel body). The destruction can be very fast (days? ), helped with the locally increasing concentration of boric acid. See NRC bulletins 82-02, 86-108, 94-63, generic letter 88-05,… and hundreds of cases around the world, the most famous being probably Davis Besse in 2002. The problem is called cavitation. I actually believe that cavitation was also involved at TMI-2, before the accident started. The arrow is pointing to the seal housing bolts within the motor stand. The bolts are below the main flange within the pump, not above. We’ve added two additional images to the original post, one of which offers a better view of the turning vane bolt location. The bolts were internal to the pump, but on the small graphic it could be confused with those used outside the pump (but within the motor stand) for the nearby seal package. No, the arrow is pointing to the seal housing bolts within the motor stand. The bolts are below the main flange within the pump, not above. It is especially important in this very risky nuclear business to learn from experience. Every nuclear plant has an operating experience group. They are tasked with looking hard at all relevant industry operating experience. But when the NRC drops the ball on an information notice we know who the real culprit is. This mistake is even more outrageous when you consider all the time the NRC had to Monday-morning quarterback this Millstone event. Wow! Very disheartening! Repeat problems plague the industry. Repeat problems lead to repeat accidents. Until the NRC takes a hardline with respect to repeat problems public safety is compromised. I was an engineering supervisor at Northeast Utilities when Millstone 3 reactor coolant pump turning vane bolts pumps failed during operation and was responsible for addressing the issue. I remember what a horror show it was to fix it. We came up with a fix but we clearly said that the fix was for only one cycle. The info notice that NRC is referring did not say anything about the fix being for one cycle only. That might have given other utilities false sense of security and they may not have done all that was necessary to address this problem. It is distressing to learn that these bolts are still failing after nearly two decades. The boltheads on a 1-inch diameter bolt are about 1½ inches across, which is too large to allow them to move past the flow openings in the bottom nozzle of the fuel assembly. While the boltheads restrict upward flow in a local area, pressurized-water reactor fuel is not covered by fuel channels. Thus, cross-flow from adjacent flowpaths would ensure cooling flow and avoided any localized overheating. The metal impact monitoring system at Salem went into operation several years prior to the identification of the RCP bolting issue. The system has a limited number of sensor locations, i.e., on the upper and lower reactor vessel and on each of steam generators. In addition, the boltheads are relatively small in size and are believed to have reached their final resting place in the reactor coolant system relatively quickly. Therefore, there are no indications that the system would have identified a sustained acoustic signal alerting the operators to loose boltheads of this size and in this location. As discussed in this blog post, the bolting in question is limited to a reactor coolant pump (RCP) design used at only three plants: Salem Unit 2 and Surry 1 & 2. The findings at Salem were quickly shared with Dominion, the owner-operator for Surry, and NRC Region II inspectors to evaluate their significance. The findings to date from the internal inspections of the four RCPs at Salem have not suggested that the failed bolting will cause a significant safety issue. The RCP issue at Salem Unit 2 will be discussed in the next NRC quarterly inspection report, which is scheduled to be publicly issued in early August. The issue was first identified in the middle of the current inspection period, which is why you have not seen information published to date. We intend to share information in this matter openly with the public, just as we would any other potential nuclear safety issue, as more details and analysis becomes available and our technical staff in Region I and NRC Headquarters evaluates this information thoroughly. With regard to formally reporting this matter to the NRC, to date the condition does not rise to the level necessitating a report under any specific requirements of 10 CFR 50.72. However, PSEG made a voluntary report of this event (see Event Notification 50176 on our website) on June 6, 2014. We would note that our inspectors observed the starting of two of the four RCPs in early May. The pumps started properly with no signs of vibration outside of expected values. Analysis of the corrosion of the bolt heads and shanks suggest that this condition existed for some time with no detrimental impact on the RCPs. We continue to evaluate this issue, and are assessing the Surry units for the potential impact on that plant’s RCPs. Your comments also referenced impeller cracking and vessel foreign material exclusion at the Palisades nuclear power plant and questioned whether the recent maintenance outage there was related to it. However, the piece of primary coolant pump impeller stuck in the Palisades reactor vessel is from the “C” pump and it broke off of the impeller in October 2011. There was no measurable impact to plant operation. The plant’s owner-operator installed a new seal package and impeller during a refueling and maintenance outage in early 2014. But after plant startup from the outage, part of the new seal package started to degrade. After monitoring the degradation, the company decided to shut down the plant to replace the seal, which was done last week. The cause of the prematurely degraded seal package is under evaluation. Does not sound like the NRC or the licensee took prompt action considering the potential safety significance of this problem. Are you saying that even these small boltheads will be stopped by the flow holes in the core support plate? Or are you saying that if they do get through they are small enough not to damage fuel or to cause localized overheating due to flow channel blockage? Also would you address the status of the loose parts monitoring system at Salem? Why didn’t this system detect these loose parts and alert plant operators? The NRC staff is continuing to assess the performance of plant personnel during previous refueling and maintenance outages as they relate to the failed bolting issue. Results of those reviews will be included in an upcoming inspection report for the Salem plant. The broken boltheads involved are small and analysis shows they would not adversely impact the operability of the plant’s Reactor Coolant System. Regarding the possible blocking of the fuel cooling channels, the core plate inside the reactor would prevent that from occurring. 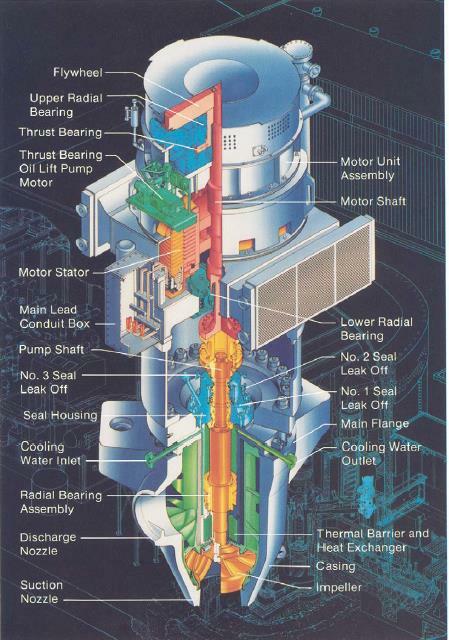 We used a graphic that was similar to the Salem Unit 2 Reactor Coolant Pump because it had a better cut-away view. The arrow correctly points to the location of the bolts. The turning vane is the green component located between the bolts and the impeller. It is a large (greater than 17,000 pounds), one-piece stainless steel device used to optimize flow from the vertical outlet of the impeller to the horizontal outlet of the pump. 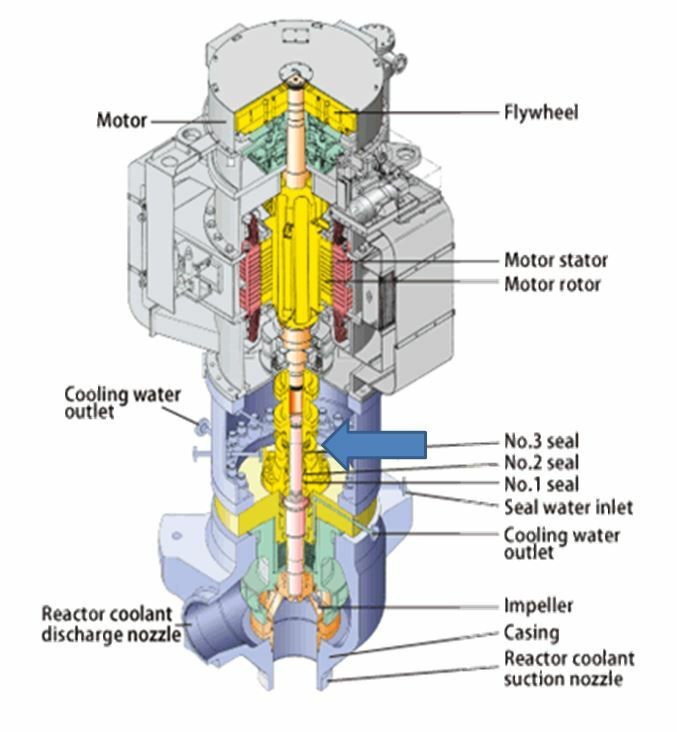 Call me crazy, I don’t think the NRC used the right reactor coolant pump picture. They got up the one without the diffuser? I bet you Salem was operating outside the pump design and plant licensing like Palisades…this is cavitation and NPSH related? Why wasn’t this problem wrestled to the ground when it was first discovered a couple of outages ago? Foreign material of any kind in the reactor coolant system is a big problem especially of this magnitude. Foreign material can block nuclear fuel cooling channels and actually cause fuel damage due to impingement. Great blog article, which points out how small parts can affect reactor safety, if they fail at the wrong time. Not mentioned in this article is what the effect would have been if this reactor had suffered a large earthquake while at full power and most if not all the bolts failed t the same time! 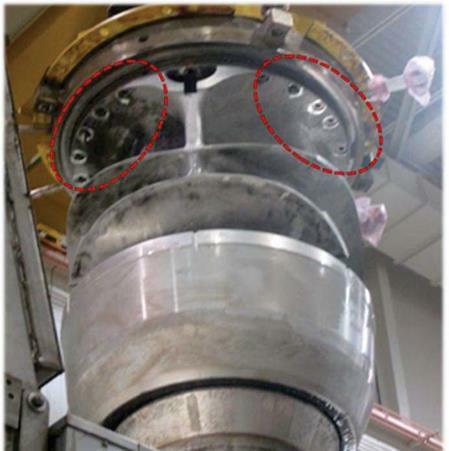 I am glad that the reactor is not in operation and urge those looking into this failure to closely examine the radius where the bolt head meets the bolt, since that area is usually a very high stressed, especially if it is rough (on a microscopic level) from machining during manufacturing. I hope that the operator will be required to much more frequent inspections of all of these bolts, in order to assess the lifespan of any new bolts and/or bolt materials they finally decide to replace the old bolts with. Bolt problems have bee found over the years. It was the Reactor Owners Groups and EPRI who presented the early experience and data to AEC and NRC and also INPO which helped inform the licensees. NRC confirmed and approved the findings and solutions proposed and implemented by the licensees. Had heard that PSEG might have encountered broken bolts on “several” previous refueling turnarounds, and replaced those broken, but not all of them. Anything come up to date that suggests the problem was seen more than once or twice before? Any summary of what the NRC is going to require of the owner in addition to prior to restart, or does it remain an issue where they can repair and restart without explicit NRC assessment and approval? Well, another question, why didn’t the NRC have the skills and education to figure out the importance of this emergent new information and use their influence to head off a worsening situation? I do get it with the NRC and these utilities with their nothing-ever-matters philosophies and every egregious and unprofessional behavior is always safe. Why can’t the agency use their influence and power to head off events like this for the good of the nation and the rate payers? Why is their so much unnecessary secrecy with RCP? What is the worst sin in this deal, this has been a cover-up! Events like this aren’t reportable with the RCP and recirc pumps and disclosed to the public. Why are problems like this so secret? All broken parts like this and inappropriate maintenance issues should be in a LER and discussed thoroughly in a inspection report. This doesn’t happen now and you know it! The Palisades PCP broken impeller pieces and blades flung all around in the coolant for over decades is an example of this also. By the way, we are wondering if the broken blades in Palisades and the shutdown for the seal job ongoing now are related? What pump is the seal job? Is the seal job the same pump who was found with two huge missing impeller blade pieces this last outage?